There are 87 points in Fish Lake where math standards are addressed. Of these, 39 are at the third-grade level, 37 at fourth-grade level and 11 at fifth-grade level. The four boxes at the bottom include 28 math activities, many of which are included in the game also. Of these, 9 are at the third-grade level, 20 at the fourth-grade-level, 4 at fifth grade, 1 at sixth grade and the remaining 5 address standards of mathematics practice that extend across grades. 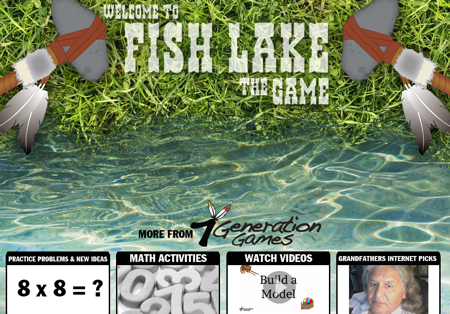 CLICK HERE if you just want to download the pdf file listing all of the math standards addressed in Fish Lake, by grade level and where each is found in the game. For further details, continue reading below. There are 24 of these that will be encountered by every player – 19 math challenge problems and 5 lessons or activities that occur between levels. The other 63 points are determined based on performance. A player who gets every problem correct will see none of these. If, at any point, he or she misses the same problem twice (because it is always possible the first time was just mistyped), the player is routed to a menu of choices of how to study – there are 39 of these in the game. These could include watching a video, reading a web page or playing a memory game, e.g. matching 3 x5 to 15. After studying, the player takes a quiz to get back into the game. There are 18 quizzes in the game. Most quizzes have 7 problems but a player will see, at most, 5 of these. If a player misses the first question, the next question is easier. If the first question is answered correctly, the next question is very slightly harder. After answering five questions correctly, the player can return to the game. When it becomes mathematically impossible for the player to answer 5 questions correctly (there are no questions left and the score is 4) OR when he/she misses 2 questions in a row, the player is sent back to the study choices to study again. We aim to please! Teachers had requested a way to go directly to math activities in the game, so we pulled out their favorite videos and activities and put them here. Teachers had also requested more activities at the lower grade levels, to enable their students with special needs to also play the game, even if they could not get very far in the adventure game itself. Teachers also requested some options that did not require Internet access for those times when the Internet was not working, so three of the four boxes (all but the Internet picks) do not require Internet access.